In my professional life, before I began writing novels, I was a psychologist. In the course of my work, I met hundreds of wonderful, courageous, loving, generous people. They all suffered some form of mental illness. After each drumbeat of the tragic mass shootings in our beloved country, a chant arises from the right wing of the choir. And offer them our thoughts and prayers. The killer was mentally ill, an animal, deranged. This chant is an obscenity. “Thoughts and prayers” are not the anti-dote to mental illness, treatment is. But what has the present administration given us regarding mental illness? A law expanding access to guns for the mentally ill! Yes, outrageous. But an even deeper outrage, to me, is the way politicians hide their cowardice toward the NRA behind tough language about mentally ill persons. Their veiled (but only thinly veiled) implication is that every mentally ill person is a potential mass murderer. If “mental illness” causes mass shootings, then . . . This is not only nonsense, it is insidious, hateful nonsense. It casts a shadow on every law-abiding, loving, hard-working person who happens to suffer from a mental illness. Just as millions of gun owners are lawful, decent, caring human beings and the gun owners who kill are a vanishingly small number of them, so too millions of Americans who suffer from some form of mental illness are upright, caring, and decent people and the number of mass shooters with mental illness is infinitely small. 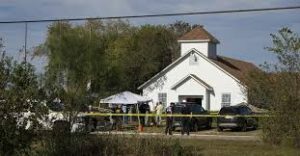 To tar all those good people in either group with the cowards’ brush—“We don’t have a gun problem here, we have a mental illness problem”—is perhaps a more hateful and fateful evil than gun violence itself. Because it is an evil perpetrated by those who do not need to do it, who commit it to divert attention from the real causes, the real problems, the real issues that make gun violence “as American as apple pie.” It is a vast smear against millions of decent people that further divides and weakens our country. We don’t need to “make America great again”—it is already great.